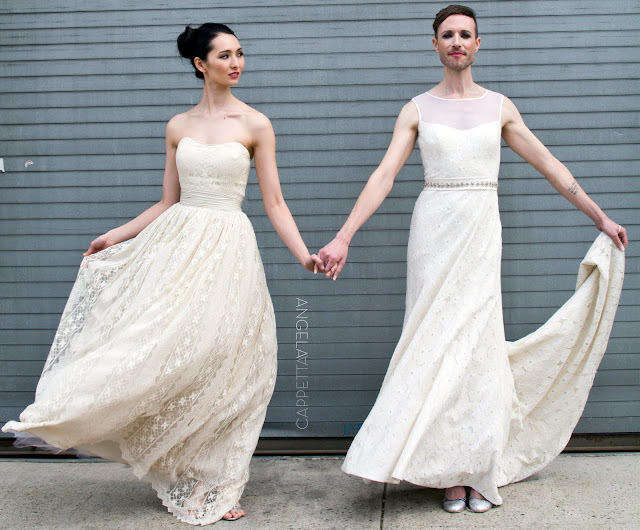 Runaway Brides with Genderfluid Celeb Jeffrey Marsh & Aine Rose Campbell. Shot for The Cotton Bride on location in Long Island City. Runaway Brides with Genderfluid Celeb Jeffrey Marsh. We shot a collection for the Cotton Bride on location in Long Island City. Comparatively, with polished gowns, we needed some grit. Hence, the industrial chic streets of Long Island City were an ideal fit. Most noteworthy, the models were none other than Jeffrey Marsh, and Aine Rose Campbell. Furthermore, the dresses are sewn by little old ladies with decades of experience. Their craftsmanship is beyond compare. “We speak glowingly about the past – roaring 20’s, glam 50’s, swinging 60’s. But, those decades, no matter how they’re portrayed, don’t come close to the incredible times we live in now. Moreover, today, anyone can marry anyone, irrespective of gender. For those who never felt apart of the status quo, these cultural strides may not mean much. But for many others the freedoms gained over the last decade are nothing short of magnificent. When Angela Cappetta first suggested casting Aine Rose Campbell, face of sustainable fashion, and Jeffrey Marsh, a gender-fluid celebrity and writer, we didn’t hesitate. And as a brand, there is nothing The Cotton Bride values more than personal expression. By this token, these two unique individuals celebrates the very real societal progress we have made. One we felt proud to support.